Employee Engagement is not a dark art – but get it right and it works like magic. Actively engaged people are good to be around – you want even more of them. Actively engaged people are more motivated, more effective, more productive and generally better to have around. We provide surveys via our Employee Engagement Software for people who want to really understand how actively engaged their employees, students or parents are. 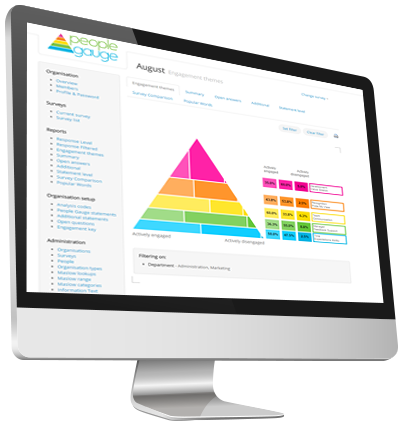 Use our People Gauge as an effective KPI to help you get the very best out of your people. Discover what your children, your parents, or your staff think and feel about your school. Our software is designed to be used as a business tool with your own clients. People Gauge is a cloud-based software solution, providing employee engagement surveys for businesses, organisations and schools who want to really understand how actively engaged their employees, students or parents are. Engaged Employees are more productive and make a positive impact on the performance and revenue of organisations. Based on the principles of Maslow’s Hierarchy of Needs, our employee engagement surveys are designed to be user friendly, intuitive and flexible. Flexible: You and your people can access your survey – anywhere, anyhow, anytime. Effective: Your reports are available within 24 hours of completion.